Michelangelo’s famous sculpture of David (1501) was carved from a massive block of marble that had sat neglected for over twenty-five years. Another sculptor had roughly hewn some legs, breaking a hole through between them, but at some point he had abandoned the work. Afterward, the block was rejected as unworkable. This seventeen-foot chunk of pearly white marble sat in the back yard of Florence’s cathedral gathering moss until, a quarter century later, an artistic genius saw it with new eyes. Michelangelo relocated the block to his studio, and created one of the most recognizable pieces of art in the history of the world. Like Michelangelo, Diego Caloca specializes in giving new life to old and neglected things—in this case, old books and Bibles. Diego is one of the most skilled Bible rebinders working today. Entirely self-taught, he has the raw talent and patience to become a masterful leather-worker of Florentine proportions. With that block of marble in mind, I recently sent my 1929 Thomas Nelson & Sons copy of the American Standard Version (ASV) to Diego in Rancho Cucamonga, California. I hoped Diego could give it new life, too, the final result amazed me. In this article, I will review the work Diego did. First, a bit about the book block I sent him: As an avid Bible collector, I had been scouting for an ASV for some time, and had not yet found one to my liking. There are a few reprints available on the internet, but the ASV—which is basically the KJV’s early-twentieth-century son—has been out of publication long enough to make good originals hard to find. Some current editions are nothing more than poor facsimiles. Star Bibles produces a good print, but at $99 for mere faux leather, I just couldn’t bite. Finally, my father, an eBay master, hooked a near-perfect copy. My edition is a 7” x 5”, two-column text edition. Black letter, with no references, it does not make use of the old-style pronunciation “helps” (thankfully). There is no writing in this pristine copy, and the presentation page was left blank. The font is a very readable Brevier 12mo. The only problem with the block itself was that the red-dyed page edging was water damaged. Not surprisingly, the original genuine leather cover was wilting like Mother’s Day flowers by the first of June. Every time I opened it, the ASV coughed up black dust from between the cover and liner. In other words, the block was a perfect candidate for a rebind project, just waiting for a master sculptor to fashion it back into a form worthy of its contents. I gave Diego carte blanche to do whatever he wanted. Normally I wouldn’t do this, but I have studied Diego’s work for a couple of years, and even written about his interesting back story. So I trusted him completely. Nothing comes out of his studio—a simple shed beside his California home—that I haven’t “Oohed!” and “Awwed!” over. So I paid for modest media-rate postage and mailed out the hand-sized ASV with my permission to do with it whatever he willed. For the cover, Diego chose a midnight black sokoto goatskin, with a mild river grain, and lined it with a slightly more modestly grained goatskin interior. He gave it a full half-inch yap, curved prominently over the block. Overall, this cover is pretty stiff. I definitely wouldn’t try to roll up this goatskin like a scroll as you’ve probably seen some Bible reviewers do before. Mark’s famous yoga pose wouldn’t work on this one. The stronger nature of the this particular arrangement allows the yap to stay curved inward, instead of hanging loosely over the edges like a wet blanket. This was intentional on Diego’s part, and he is capable of doing more limp bindings when asked. But given the aging nature of this particular text block, and the somewhat weathered texture of the of the nearly century old paper, this was probably a wise call. Some clients who prefer limper bindings would do well to specify that they want a cover/liner combo that melts in the hands. At the same time, the pronounced, curved yap of this particular rendition added overall strength and protection to the final form, giving this rebind a lasting, durable feel. To the fingertips, the feel of the leather Diego chose is somewhat close to the goatskin of some Cambridge Clarions I’ve seen, if only a bit more subtle in the grain pattern. He also gave the cover a gorgeous tooling line, an eighth of an inch from the edge, further adding to the luxury of the stately black leather. In my own view, the tooling looks great in black, and I do think that Diego specializes in jet black and dark brown leathers. This is just a personal, aesthetic opinion of mine. Diego can order any leather color or texture that you want, or even work with one that you send him by mail. I’ve even seen Diego transform some couch leather for another customer into a custom Bible skin. But if you should happen to have him do a rebind, I’d say consider the darker leathers as your first choice. His corner work is utterly superb. I rebind Bibles myself, and recognize instinctively when my own work is greatly excelled. One of the reasons that I don’t sell my rebinds anymore—I mostly give them away—is that I just can’t manage to pull off what Diego does. He’s got the touch. I just...don’t. Where this Bible really sticks out among my collection of sacred texts are the raised ribs and the page edges. First, the ribs on the spine are unlike those I have seen anywhere else. Neither R. L. Allan nor Cambridge nor Schuyler are doing ribs like this—and it is a shame, because they are absolutely stunning. The ribs are made by a thick piece of cord under the leather, rising up triumphantly with tooling on either side, creating an almost a pyramid-style look. They are the best I’ve seen. The high end publishers should order a Caloca rebind and tell their manufacturers to replicate this feat. Second, remember that water-damaged page edging? Diego brought my book block back to its original bookstore red by adding archival ink to the page edges with a cloth applicator. The color is quite august, not the light salmon color of the art-gilding on a Cambridge Wide Margin, but more the blood-red hue seen on older hymnals and Bibles. Personally, I love it. Does anyone else even attempt what Diego does with the page dying? Give other Bible rebinders a call and ask if they do this, and you are likely to hear silence or a click on the other end of the phone. If you need work done on the page edges, Diego seems to be your best option at this level of skill. He tells me that he can do this underneath gold page gilding without harm, stepping it up a notch. At this point, adding both gold and red underneath is still a trick mastered by very few book artists. In the interests of transparency, I should mention one flaw. The gold stamping of “Holy Bible” on the spine looks like it is flecking just a bit. Perhaps the texture of the leather prevented the gilding from adhering? Still, the imprint looks satisfying to the eye. It takes some nerve to critique Diego in an area that I cannot even attempt, let alone surpass, myself! This is one area in which I think Leonard’s and AA Leather may be a step ahead. Any time you have a handmade piece of artwork—and that’s what this is—you can expect idiosyncrasies. That’s why we call them handicrafts, and why they often excel in glory their store-bought, mass-produced counterparts. If you’re worried about the gold-stamped flecking, have Diego dry-stamp the spine without the gold embossing. It looks every bit as regal that way. When I sent this nearly century-old ASV to Diego, I expected to get back a Bible that I would actively use. But when I saw the finished product, I knew that it would just feel wrong somehow to use and abuse this one too much. It’s just too beautiful. Like Michelangelo’s David, great artwork is better to savor with the eye than touch. So this one is going to end up as a trophy piece in my collection, pulled off the shelf occasionally to photograph and admire, and I’ll send Diego Caloca another edition to rebind in the future. Hopefully I will have the audacity to use that one more regularly! If you are interested in having a Bible rebound by Diego Caloca Jr., please contact him through his Facebook page, Caloca Bible Rebinds. BIO Matthew Everhard is the Senior Pastor of Faith Evangelical Presbyterian Church in Brooksville, Florida. An ordained Presbyterian minister, he collects, reviews, and rebinds Bibles as a hobby. 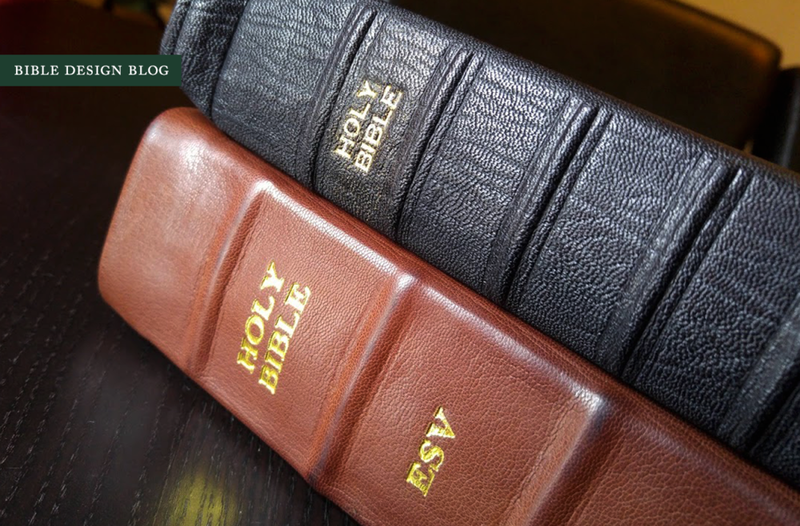 You can read Matthew's earlier contributions to Bible Design Blog here.